Los Angeles Center Studios launches its first public filmmaker competition. Geared towards young filmmakers, the Los Angeles Center Studios Young Filmmaker Competition was created to provide a platform for a talented young creator to screen her or his film. Submission-based, the competition is structured to begin March 16th and end April 17th. Offering the 400-seat, state-of-the-art Beaudry Theater as a part of the winning prize package, the winner will have the opportunity to reach a larger audience with his or her film and screen it for industry professionals. “We’re thrilled to launch this competition at Los Angeles Center Studios as it really offers a chance for us to support young professionals and to showcase their skills and creativity,” said Dolly Wyatt, director of marketing at Los Angeles Center Studios. 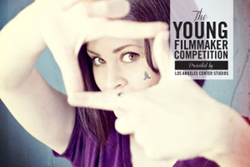 The Los Angeles Center Studios Young Filmmaker Competition is open to individuals aged 18-30. Submissions are required for entry and the film must have been completed after January 1, 2014. Full requirements are available here: http://lacslife.com/los-angeles-center-studios-young-filmmaker-competition. Los Angeles Center Studios is a full-service studio for television, film and commercial production -- a true work|play|shoot for entertainment interests working collectively in a single campus environment. Set on 20 acres in the heart of downtown Los Angeles, this full-service studio features six 18,000 sq. ft. state-of-the-art soundstages and 450,000 square feet of short- and long-term 'Class A' office space for entertainment-related and creative companies in industries ranging from film and television to gaming to music to technology. Los Angeles Center Studios has hosted numerous feature films (including “The Hunger Games: Mockingjay”, “Inherent Vice" and “ Transcendence”), television programs (including “Mad Men,” “Castle,” "How to Get Away with Murder" and "Scandal"), commercials, music videos, concert rehearsals, and events since opening in 1999. More information about Los Angeles Center studios can be found at http://www.lacenterstudios.com.